On a sultry evening in early July, the Whalers cricket team, still smarting from a disappointing result against Elthorne CC, ventured up the Northern Line as far as Highgate. The ground offered the promise of a healthy total, with a short boundary on the pavilion side, and spirits were high. Whalers’ skipper, Dickenson, strode forward to take the toss, and in line with a recent run of bad form, lost. Once again, the team would take the field in the heat of the day, allowing the opposition to take refuge from the merciless sun during the critical hours. At first, the captain’s poor tossing proved a bad omen, as ECA swiftly notched up 50 runs off just 7 overs. The two opening batsmen, Messrs. Payne and Stiff each took a healthy 26 runs each before retiring. However, just as moral was sinking with the setting sun, the crucial breakthrough came, with Gibbins taking the team’s first wicket. Gibbins went on to finish his spell with a maiden over, with figures of 1 for 16 off 4 overs. Williams took the ball at first change, and with new batsmen taking position at either end, seemed certain to lead the charge. 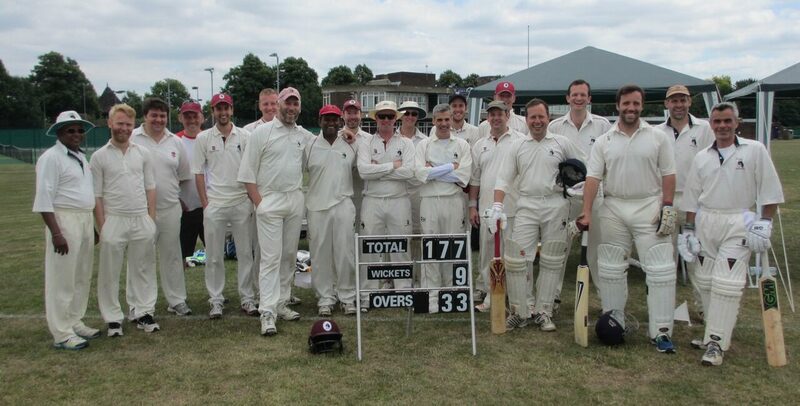 However, some unfortunate fielding, allied with a degree of bad luck, led to a number of runs being added to the total. Hanmer, bowling from the car-park end, was also unlucky to be consistently hit for 2 boundaries in each over, but improved his figures in the 12th over with a stumping, having deceived Pelling into striding up the wicket only to see his bails flying due to the swift reactions of Ollie Bayne. for 21 off 3 overs. Osbourn strode up for two overs towards the end of the innings, and achieved the excellent figures of 1 for 3 off 2, evidence again of the damage you can do with a small leather ball and 4 foot long arms. Other notable fielding moments included a horrific example of catch-avoidance by Nelson, and some impressive, if not strictly effective, diving by Williams, both in the slips and later, at point. ECA finished their innings with a total of 122 – respectable, but entirely within the grasp of a team who average about 130 irrespective of the number of overs played. In the batting stakes, early successes were claimed by Cave (25 retired) and Vanderpump (13, caught at Mid-off) before Nelson took the crease. In perhaps one of the briefest encounters between willow and leather, he lasted just one ball, which he attempted to dispatch with customary abandon, succeeding only in losing his wicket for 0. Thankfully, Osbourn could bring his technically perfect batting style to the rescue, and having performed in the bowling stakes, added 26 to the team’s total before retiring.